Sometimes the right storage solution is something as basic as a shelf. But, of course, I'm going to show you some not-so-basic shelving options. 1. The shelves above are made from reclaimed pine - and look at those brackets! They come from Cocopa, whose furniture is made entirely with reclaimed and sustainable wood. 2. 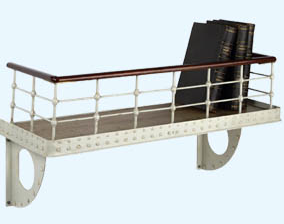 The steamship upper deck bookshelf is made with riveted metal, and has a hardwood rail and floor. 3. 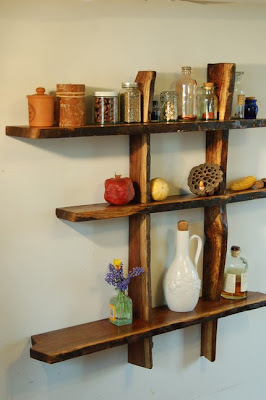 This driftwood shelf (topped with reclaimed plywood) has a fascinating history; read about it on DaWanda, a site I've seen described as a Euro-Etsy. [via Apartment Therapy] Update on October 11, 2009: This product is no longer being shown on Dawanda. 4. 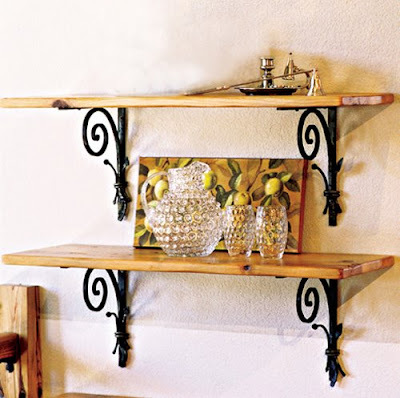 Speaking of Etsy, this shelf by A. Drauglis is one of many he has for sale on Etsy. 5. 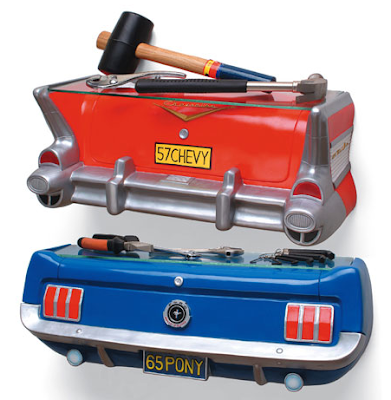 What can I say about the rear bumper wall shelf? 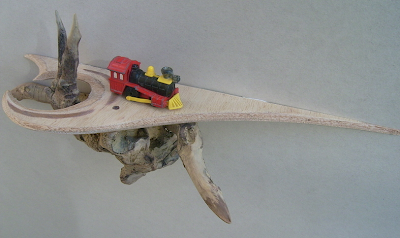 I Actually really like the driftwood and steamship ones - it is always neat to see how others tackle the same form. Art, you are very welcome; thank YOU for making such lovely things! I'm glad to know you enjoyed seeing some of the other shelves; I love pulling together posts like this, and am always delighted to hear when someone likes reading them as much as I like writing them!